FJ Hakimian Tabriz Carpet. #99289. 20'0" x 14'3" (610 x 435 cm). One of the greatest Persian carpets, Wagner Garden Carpet is currently highlighted in the special exhibition Eternal Springtime: A Persian Garden Carpet from the Burrell Collection at The Metropolitan Museum of Art. 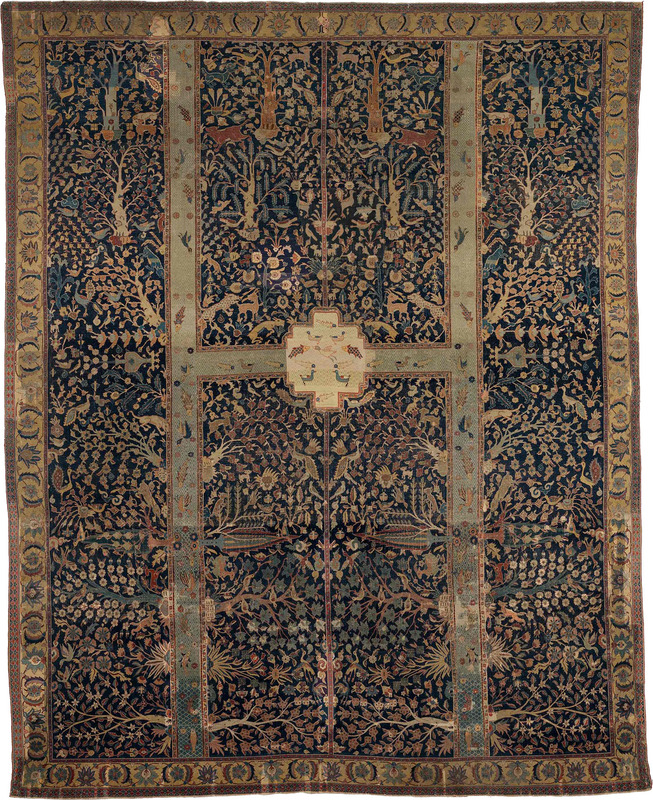 This carpet is on view at The Metropolitan Museum of Art for the first time and is the third-oldest-known Persian garden carpet, dating from the seventeenth century. The Wagner carpet has a reputation of unique and beautiful horticulture design. There are no other carpets known that use its base pattern in whole or in part. The "Wagner" Garden Carpet, 17th century. Iran, Kirman. Cotton warp; wool, cotton, and silk weft; wool pile. Lent by Glasgow Life (Glasgow Museums) on behalf of Glasgow City Council: from the Burrell Collection with the approval of the Burrell Trustees. The Metropolitan Museum of Art. Read about this exhibition. The concept of Paradise as a garden is one of the most ancient and universal ideas. This is particularly true in Persia, a land that consists mostly of bare mountains and steppe and where the presence of an oasis with water and shade trees seems almost magical. In Persia, from time immemorial, the oasis or its man-made counterpart, the landscaped garden, have served as places of repose and refuge from a hostile environment as well as settings for hospitality, entertainment and pleasure. These themes have been developed and incorporated into Persian gardens for more than 2,500 years, from the pleasure parks designed for Cyrus the Great to the medieval gardens of Timur (Tamerlane) in Samarqand, from those of Shah Abbas in seventeenth century Isfahan, to modern examples of today. The hallmarks of the classical landscaped Persian gardens are geometric layouts of pools and water channels alongside ordered arrangements of trees and flowerbeds. The ancient Persians called these formal “walled gardens” pairidaeza. The influence of the pairidaeza can be seen in the varied designs of landscaped gardens throughout the Islamic world, India’s Taj Mahal and the Moorish palace of the Alhambra in Spain. The concept of the pairidaeza reached the classical world through Alexander the Great after his conquest of Persia and its inspiration is apparent in formal European gardens like the magnificent grounds at Versailles and the estate at Chatsworth. Indeed, even in the West, the formal Persian garden is considered so perfect a metaphor for the image of a heavenly garden of eternal spring that the very words for “paradise” in English, French, Italian and other European languages derives from the old Persian word pairidaeza. 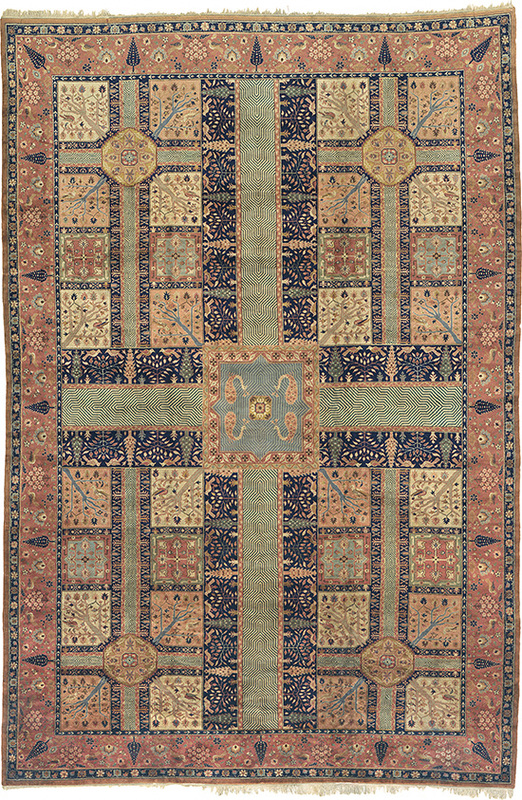 FJ Hakimian Ziegler Sultanabad Rug #06216, Persia, 1890. 16'3" x 13'3" (496 x 404 cm ). Although the garden imagery abounds in Persian poetry and art, surely the art form which most successfully conveys the beauty and serenity of the Persian garden is the carpet. The earliest garden carpet was the legendary “Spring of Khusraw” carpet made for a seventh century Persian ruler. Of enormous size and incredible splendor, it was said to depict a garden with trees, paths, flower beds and blossoms worked in silk, precious stones, gold and silver threads. This marvelous carpet can be seen as a prototype for later Persian and Persian-influenced Indian garden carpets. FJ Hakimian Indo- Persian Rug #09038. India. 17'0" x 11'2" (519 x 341 cm). Garden carpets can be classified into three groups according to their designs. 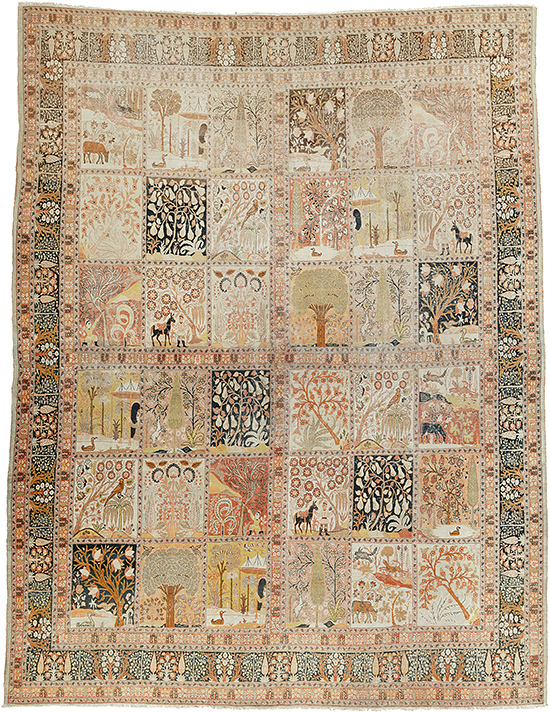 One category features directional landscapes with trees, like the exquisite hunter green around the Persian “Tree and Garden” carpet in the Philadelphia Museum of Art or the fantastic Mahal Tree carpet in the Victoria and Albert Museum. An important variant of the “Tree” type of garden carpet is the Indian floral lattice group; these carpets exhibit characteristic all-over trellis field designs with various types of flowering trees, shrubs and plants in each compartment. In the second category of garden carpets, figures of animals and birds are incorporated into landscape tableaux to create visions of a “Paradise park.” Examples of the “Paradise park” group include the Stieglitz carpet in the Hermitage, Safavid fragments in the Montreal Museum of Fine Arts and Persian and Mughal carpets in The Metropolitan Museum of Art. The third and most characteristic type of Persian garden carpet is one which presents an architectonic, map-like plan of a formal, walled garden divided by walking paths and water channels into four or more plots filled with flowers, fruit and shade trees, and various animals. The seventeenth century Persian garden carpets in the Jaipur Museum, the McMullan garden carpets now in the Fogg Art Museum and The Metropolitan Museum of Art, and the Wagner carpet in the Burrell Collection (exhibits at The Metropolitan Museum of Art till October 7th). 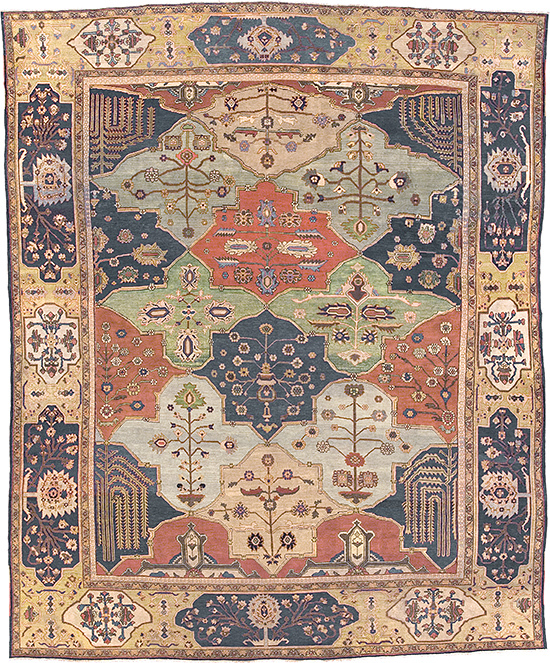 FJ Hakimian Tabriz Rug #07150. Persia, 1890. 14'2" x 11'0" (432 x 336 cm ).